The One Health concept recognizes that animal and public health, along with the environment, are interconnected. Hence, multidisciplinary teams that take into account the complex nature of interactions in the interfaces between and among animal, public, and environmental health are critically important. Many pathogens, referred to as “zoonotic”, may be transmitted from animals to human and vice versa and their impact is most important in some particular social groups and geographical regions, such as certain Asian, African, and Latin American countries. The need for securing a sufficient amount of safe food to the human population is aggravated by the inescapable fact that human populations grow at a global scale. There is an urgent need for supporting primary production of safe food, and social development in developing economies, with the ultimately goal of supporting the goal of feeding the world and promoting sustainability. Towards that end, there is also a need for generating knowledge, developing skills, and implementing tools to prevent, control, and eradicate animal diseases that impair production, prevent international trade, and affect human populations. The objective of the program of excellence introduced here is to take advantage of capacities and promote synergies that go beyond those expected by the simple sum of existing capacities and resources in Minnesota and Madrid (M x M = M²). The cultural and geographical proximity with Latin American countries will also be considered in the implementation of this program. 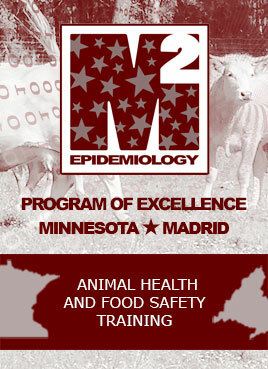 One of the objectives of the M² program is to facilitate the generation of knowledge and development of skills for young profesionals in the areas of human, public, and animal health to promote the prevention, control, and eradication of diseases. Scientists trained on this program are expected to play a leading role in the development and implementation of future epidemiological programs in the US, and Ibero-America (Spain, Latin America), and to facilitate primary production and trade through those economies.